In the previous office the storage wall used hanging filing frames which meant much of the potential filing space was being used for shelving instead. To streamline the storage system the storage wall was changed to lateral filing so that the full heights of the storage wall could be used for filing where required. This also meant that the archive process could be simplified by fitting a high density rolling storage system in the basement that could take lateral filing. 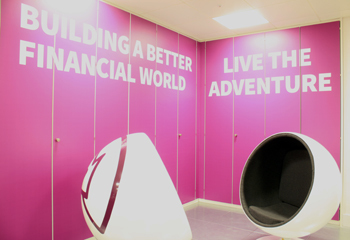 The starkness of the banks of storage wall were softened by adding graphics to the fronts of the units with either fun images or inspirational statements. The archive area in the basement was fitted with the MTM Rollastore system . This system fitted a total of 628 linear metres of storage into a space of around 45 square metres and the shelves could be used either as standard shelves or as lateral filing. Finally to make more use of the personal pedestals each person had at their workstation, WE fitted them with a cushions so they could serve as an additional "perch" point for informal and spontaneous chats and meetings at an individuals workstation.